Tour 4 Ancient Mayan Ruins With An LDS Perspective! This amazing Ultimate Book of Mormon Adventure tour will take you to some of the best ancient Mayan ruins in Mexico! These Mayan cities date back thousands of years and show evidence of the cultures, religious beliefs, and traditions which are similar to those found in the Book of Mormon. We are going to tour these sites with the Book of Mormon in mind. While at the resort, enjoy lectures relating to the Book of Mormon. Witness the Book of Mormon come to life in ways you never imagined. Click Here to read what others have said about this trip! This is so much more than a cruise! Our traditional Book of Mormon Cruise does have some limitations. When we travel to the Mayan ruins by cruise ship, our schedule must conform to that of the ship. By staying in Cancun, we are able to visit some of the ruin sites that are not accessible to our cruise ship tours and we can stay much longer at each site since we don’t have to catch a boat. Plus, the sites that we are able to visit on this trip are less crowded and offer some of the most amazing Book of Mormon evidences in all of Mexico! We travel from the resort to the ruins in new, air conditioned vans. Our local tour guides are LDS and provide us with an LDS perspective tour of each site. (Click Here to learn more about our local guides.) Our lunches while out at the sites are provided by the highest rated restaurants that offer great food and clean water. We spend these 6 days/5 nights at an All-Inclusive deluxe resort in Cancun, Mexico. Like a cruise ship, the unlimited meals, snacks, and drinks, along with all the great resort amenities, activities, and entertainment are included with the single purchase price. The resort is located right on one of the most gorgeous beaches in Cancun and caters to families. Please visit the resort website for all the incredible information about the property and accommodations. Take a look at our testimonials and see what others are saying. Arrive in Cancun and be transported to our 4 star All-Inclusive resort just 20 minutes from the airport. 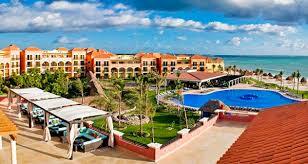 The Ocean Coral and Turquesa Resort is rated as one of the best resorts in Cancun. “All-Inclusive” means just that! Everything the resort has to offer, including the food, drinks, activities, and entertainment, are all included in registration costs. We will meet for a fireside tonight and preview what we are going to be seeing and learning throughout the week. A seminar will be offered this morning which will introduce us to our Book of Mormon Tour. Our topics will include “Mapping the Book of Mormon to help better understand the message”, “Potential present day geographical locations based on Mormon’s clues”, “Why Book of Mormon geography matters to the Latter-day Saint”, “What Joseph Smith didn’t know in 1830”, and so much more! The rest of the day is set aside to enjoy the beautiful resort. The resort has endless amenities and activities to enjoy. Many people come to the resort for a week and never leave, but you may want to head into Playa Del Carman or Cancun for shopping and site seeing. Or you may want to do nothing but read a book while sitting on the white sand of the beach. Today we will visit the ancient Mayan cities of Tulum and Coba! 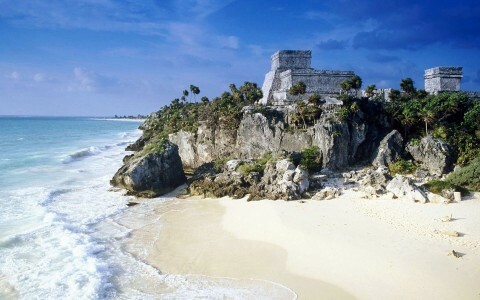 Tulum is a picturesque ancient city that is a must see for Book of Mormon enthusiasts. The city of Tulum is covered in with depictions of the Mayan religious beliefs that correlate with the religious beliefs taught in the Book of Mormon. Tulum is also home to the Temple of the Descending God. Coba is one of the most important sites of the Mayan world because it was both a huge city and a religious center. 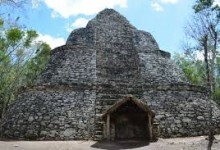 Coba is home to the Nohoch Muul temple (the tallest pyramid in the state) which you are able to climb. This site will provide regular bikes or adult sized tricycles for us to use. This is a fun way to travel throughout the ruins! We will also visit an authentic Mayan village where we will see how the Mayan lived and, for those interested, take a swim in a fresh water cenote. This trip will also include a Mexican lunch buffet. This day trip is included in the price of the tour and includes private transportation, bottled water, lunch, entrance to Tulum and Coba, and personal LDS tour guides. After our full day of touring sites on Wednesday, we have set Thursday aside as a day to relax at the resort. You may want to relax at the pool, the beach, play a round of golf, read beneath a palm tree, or do many of the other exciting activities the resort offers! For those interested, we have secured tickets at a reduced rate to Xelha! Xelha is located near our resort and is rated as one of Cancun’s best attractions. Your entrance fee will allow you to have unlimited dinning and unlimited use of all the amazing activities. Click here for the website to get an idea of how much fun Xelha offers. You may choose to visit Xelha for just a few hours, or for the whole day. A Book of Mormon seminar will be offered this evening. Our topics will include “The Book of Mormon Warning the Mayan Failed to Heed”, “Lessons from the Mayan’s for Latter-Day Saints”, “The prophetic callings of Moroni and Joseph Smith”, “What was Moroni doing for the 36 years he carried the plates”, and so much more. 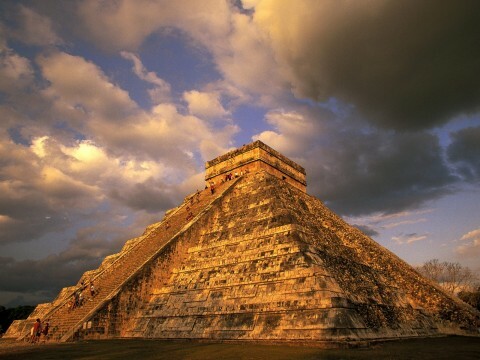 Today we will visit the majestic Chichen Itza and Ek Balam. Chichen Itza is now one of the Seven Wonders of the World. We will meet our local LDS tour guide that will transport us via air conditioned, first class buses. The Kukulkan Temple at Chichen Itza stands over 70 feet tall. Kukulkan is the name the Mayans gave to Deity. Kukulkan is represented by a feathered serpent. This astronomical wonder was designed so that at the Spring and Winter Equinoxes, the rising and setting sun will cast a shadow in the shape of a plumed serpent that slithers down the Northern side of the pyramid to the serpent’s head at the base. We will also see one of the largest Ball Courts in Yucatan. Ek Balam dates back to 300 BC and is covered in many archaeological evidences that correlate with those mentioned in the Book of Mormon. Visiting Ek Balam gives us a unique opportunity to step back in time to a Book of Mormon era city. We will also have a chance to swim in a cenote (a freshwater sinkhole), visit an authentic colonial village, and enjoy a Mexican lunch buffet. This day trip is included in the price of the tour and includes private transportation, bottled water, buffet lunch, entrance to Chichen Itza, Ek Balam, the cenote, and private LDS guides. You are welcome to continue enjoying the beautiful resort until it is time to catch your shuttle to the airport. Please inquire about staying extra nights for an additional cost. Prices are per person and include: 5 nights at the gorgeous All-Inclusive Ocean Coral and Turquesa Resort, participation in our seminars, ground transportation to/from the Cancun airport, and entrance to four ancient Mayan ruins with personal tour guides. As a guest of the resort, you will have free and unlimited access to all the restaurants, entertainment, and recreation which the resort offers. Witness the Book of Mormon come to life. Join Tom Pettit and have fun learning about the evidence of what you have always known to be true on this incredible Ultimate Book of Mormon Adventure! Tom’s unique focus on these tours is not to just teach the history, but to help you draw closer to the Savior by applying the lessons taught on this Book of Mormon Tour to your own daily life. Tom has become a student of the information taught on this and our LDS Church history tours. He has become a student of the Mayan civilization and the Book of Mormon by devoting several hundreds of hours to studying. He has been teaching the gospel to youth and adults continuously for the last 15 years by serving as a youth Sunday School teacher, an Elders Quorum presidency councilor, Ward Young Men’s Presidency councilor, Stake Young Men’s Presidency counselor, Gospel Doctrine teacher, Mission Prep class teacher, and counselor in the Bishopric. Tom served his mission in Australia. He and his wife Lesa have five children and live in Lehi, UT. To learn more about Tom Pettit, please visit our About Us page and his Blog. Booking Requirements: $400 per person is due at the time of registration. Terms and Conditions: All Rates are per person. If making your final payment by credit card, please add 3% for the bank transaction fee. Additional Nights: Additional nights can be purchased at the time of registration. Trips to the Ruins: Included with the cost of your vacation is our tour of four Mayan ruin sites, private transportation to/from the resort, all admission fees, bottled water, buffet lunch, and LDS tour guides. Airfare: Rates do not include airfare, but do include ground transportation to/from airport in Cancun. Please contact us prior to booking your airline tickets. Passports: Passports are required for this trip. Passports can take up to 8 weeks to arrive so please plan ahead. What is an All-Inclusive Resort: Like a traditional Book of Mormon Cruise, an All-Inclusive Resort provides your accommodations, unlimited food and drink, and endless entertainment for just the cost of this tour. However, unlike a cruise, this resort has spacious accommodation (with a large balcony), a beach that never leaves, gourmet cooked-to-order meals, less crowds, less noise, and no schedule! Our activities are not dictated by a ship’s schedule. Everything, except airfare, is included with your all-inclusive tour rate. Space is limited so book early! Click Here to Read What Others Say About This Trip!